I’ve climbed up to the High Spy ridge via Knitting Haws using the Public Footpath from the Borrowdale Gates Hotel several times before. I’ve passed just the other side of the holly tree on the right of the photo skirting around and hardly noticing the small ring contour on my right. That small ring contour is Peace How and was gifted to the National Trust in 1917 by Canon Rawnsley as a rest and recuperation spot for soldiers returning from the First World War. It is indeed a serene place with views to the north over Derwent Water and to Castle Crag to the south through the Jaws of Borrowdale. A slate seat marks the summit. It is certainly a peaceful spot and would have been so far away from the horrors of the trenches. Shamefully it is not named on small scale Ordnance Survey maps. 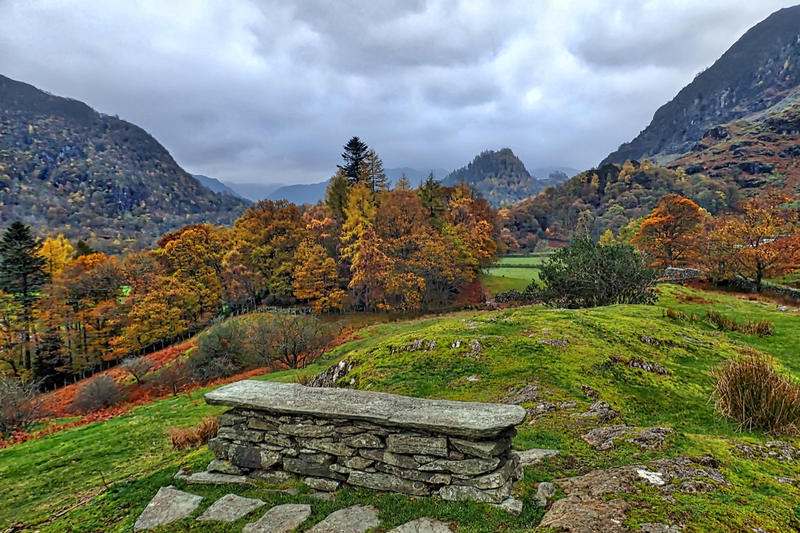 Castle Crag, “the magnificently independent, so ruggedly” hill, according to Wainwright, is a War Memorial to 2nd Lieutenant John Hamer and ten other men of Borrowdale who lost their lives in the First World War. It was gifted to the National Trust, in 1920 by Lieutenant Hamer’s family. The gift of Castle Crag followed the donation of Scafell Pike, England’s highest mountain, to the Trust by Lord Leconfield as a War Memorial. A beacon was lit on the summit on Peace Day in 1919 to signal the end of the war. Then in 1923, a further 12 summits were donated by the Fell and Rock Climbing Club in memory of the fallen. Lingmell, Broad Crag, Great End, Seathwaite Fell, Allen Crags, Glaramara, Kirk Fell, Great Gable, Green Gable, Base Brown, Brandreth and Grey Knotts. Each year, at the eleventh hour on the eleventh day of the eleventh month a service is held on the summit of Great Gable in all weathers.